So after our move-out-of-town-and-into-a-van fiasco we finally felt like things were settling into place. After a van camp near a local Vancouver park our first night and an Abbotsford Walmart stay our second, we were on the road east heading to Waterton lakes provincial park going through Hope, Manning and Princeton. Manning Park gifted us with a moose spotting and our hopes immediately heightened. As we started the long drive up to Princeton toward Waterton we were realizing the amount of serious distance we were trying to cover in 2 measly months. We understood that we were trying to smash literally 1/3 of the distance of this entire trip into an extremely short amount of time, not to mention we had agreed to meet both sets of our parents in the states in September. This was really upping our stress levels thinking about how much driving we would be doing every day in order to get to the most northern point possible in Alaska and then back down in early August. We were nearing the turn off: east for Waterton or north to Kamloops. With a quick compulsive decision we decided to skip over our original starting point and head north to cover more ground. Slight sigh of relief but this still didn’t solve the problem. 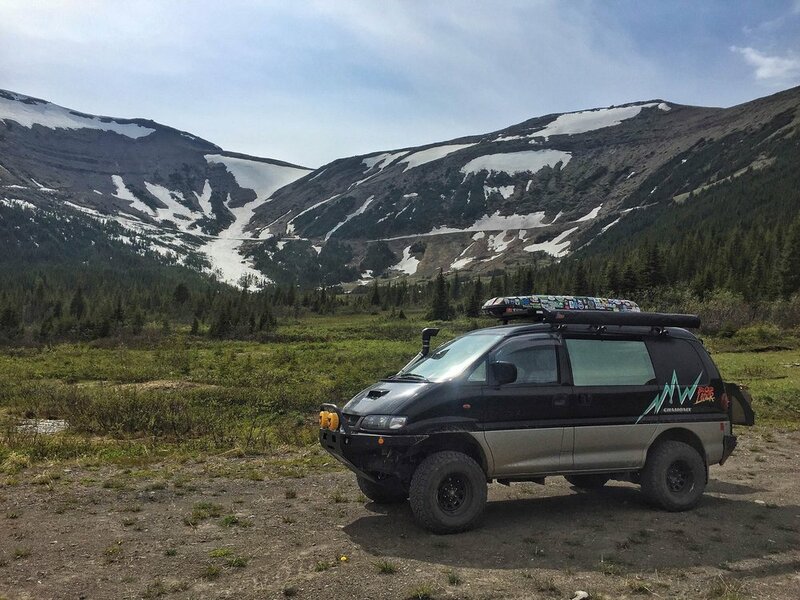 We found ourselves navigating to Wells Gray Provincial Park; a place we’ve always wanted to check out living in BC. iOverlander helped us out with a trail head camp sight and there we were drinking beers and passing out trying to figure out tomorrow’s events. We thought we’d get up early to beat the rain, so we did and tackled a short hike to Spahats Falls. In just 2km we were looking down over 240 feet at this massive gorge, taking it all in and making it back in time for some egg wraps and coffees before the 20 minute hail monsoon that had us racing to the van with all our kitchen gear. Helmcken Falls was next on the list and northbound in the park. We drove out of the storm and got to see one of the most prominent vertical drops in BC falling at 463 feet. After Wells Grey we started heading towards Mt. 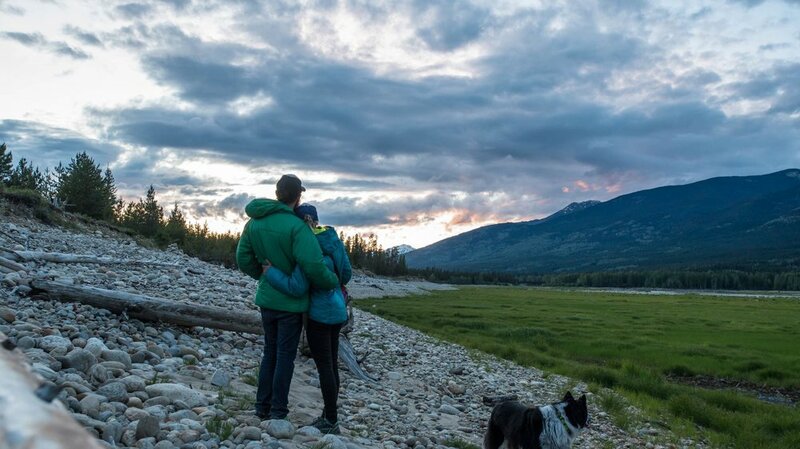 Robson Provincial park through Valemount BC and made yet another huge executive family decision. This time, we decided that this trip meant too much to us to just wiz through the northern part; we had been saving and planning for years, so we put our feets down and added another month to explore the north! It might not seem like much, but for us it meant less stress, more time to hike and explore and less time worry about making it back in time for obligations. And phew, an EVEN BIGGER relief was that our parents could switch up their trips to still come out and see us! Then Valemount happened. Turns out Valemount is one of the coolest towns in BC surrounded by HUGE peaks, river valleys, infinite hikes, and this sweet lil brewery called 3 Ranges Brewing. We had a delicious beverage and once again used trusty iOverlander to help us find a camping spot. This would be our 4th free spot of the trip unless we decided to high tail it to Mt. Robson and pay $29 for a 5x5 patch of dirt with a picnic table. We opted for the 1st option and we are so happy we did. 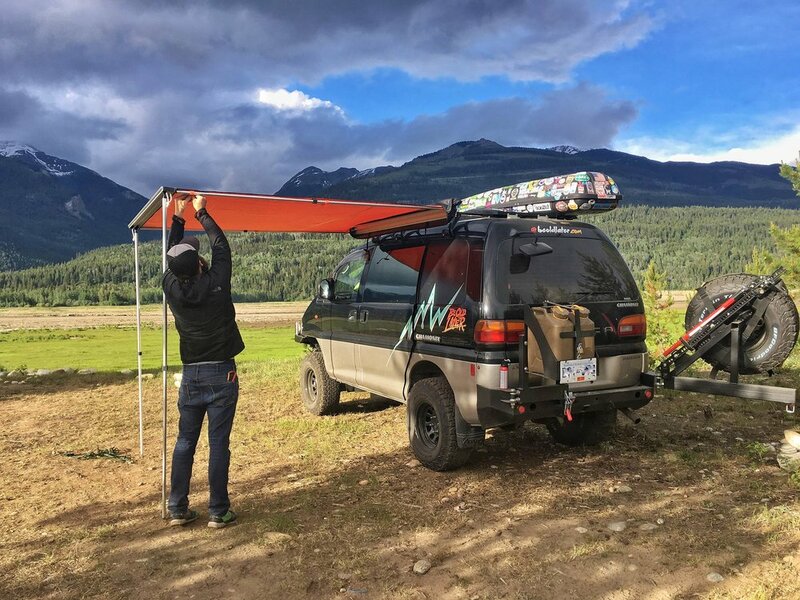 We followed iOverlander’s directions through Valemount proper, across the train tracks, over into FSR zone where we crossed an old wooden bridge, then, low and behold, this beautiful river valley with too many camp-spots to count opened itself up to us. We followed our mini motto “just a little further” and drove a bit more to a small abandoned hippie commune constructed out of driftwood, rocks, and pine cones. This place had everything, a driftwood teepee house, a 3 story rock fire pit, drift wood benches, separated soils on display and a small toilet made out of rocks with a little wooden seat. A temporary free heaven with mountains surrounding us on all sides and a golden sunset for the books. Not too bad for our 4th day on the road AND we even got a chance to put up our sweet new Tepui awning and mosquito netting. On day 5 we woke up at Kinbasket lake, ate a banana and an egg and drove on over to Mt. Robson National Park for a hike. When you turn this corner on the highway and see Mt. Robson towering in front of you it just looks like you’re headed into a giant wall of mountain rock. Our jaws dropped. We took it all in, arrived to the park and headed to Kinney Lake. We hiked around 14km round passed Kinney Lake campground. It was our first long hike in a while, and we were so excited to do it that we forgot to pack any snacks. After talking about food most of the way back we finally got to the van, ate some cold spaghetti leftovers out of a bag like savages, and drove to Jasper. A much needed coffee, cookie and burger later we were on our way to camp for the night at Gregg river forest service road off the main highway away from the direction we were going. We played with the high beam lights a bit and then finally arrived at our camp and passed out to weird noises in the bushes. On the morning of day 6 we had a half tank of gas and thought it would be a perfectly fine amount to get to our next destination of grand cache. Needless to say we coasted on E putting the van in neutral down hills to save every sip of gas. There was no warning light but we didn’t want to take a chance. We looked up info on a bunch of delica forums to see how long the van could last on fumes and then of course we hit construction with stops and traffic. We made it to a gas station in grand cache but we were holding our breath. For a “phew” moment we headed to sulphur gates regional park to make a relief coffee and take a break. The park was gorgeous. It’s the location where the smoky river meets the sulphur and the cliffs surrounding are massive and spectacular. We even found a loner morel mushroom hanging out behind our picnic table! To solidify this day we were headed to tumbler ridge and without knowing the entire road was dirt, took the 52E from Grand Prairie to Tumbler. As soon as you crossed the border from Alberta to BC the paved road turned to gravel and dirt aaaand it was like that for over an hour and a half (we would meet a local a couple days later that called us “adventurous” for taking that route — 52… E!). It was getting late but we were kind of stoked and felt adventurous so we kept going. By 11:30ish we started turning down regional park signposted roads and by the 3rd one we had found a solid free camp spot at stony lake regional park. First offroad sesh woo! We woke up on day 7 overlooking stony lake and seeing mountain peaks from tumbler ridge in the distance. We learned about the tumbler ridge area via the city of dawson creek’s website and were blown away. The hikes in this park looked stunning; so many alpine options, dinosaur tracks, waterfalls, caves, you name it! I couldn’t believe we hadn’t heard of it. We were so excited to head to the visitor’s centre, check out some routes and go for a hard day hike. On the way out of stony lake we saw this weird figure standing straight up, looking around up the road. It looked huge and we were thinking it was some weird tall dude or a moose. Turns out it was a mama grizzly and her older cub checking out our van driving up the road. Ok… cool. I mean, it’s awesome to see wildlife but grizzlies that close by are pretty intimidating. We arrived at the visitor’s centre, decided we were going to quickly do the Dino track hike and then head to mt. Spieker. It should have been an easy but tiring day. The road we drove on for Mt. Spieker was over 36km long. We passed 6 logging trucks and then turned off by an active mine. We saw no humans after this for the next 15 minutes. As we arrived closer to the trailhead we saw ANOTHER gigantic grizzly just off the side of the road maybe 5 minutes from the trailhead. Ok so that’s 3 in 1 day. More than we’ve seen ever. At the trailhead we heard this crazy pounding noise which was coming from the gas extraction well oddly right at the start of this hike. All vibes were uneasy. We knew there were no humans around for 40 minutes, there was this creepy bashing sound, and we had 1 can of bear spray and some knives. As hard as this is sometimes, we decided to make an adult decision and not do the hike! Our parents and friends were very happy hearing this story.